This is the beginning of a series of stories I want to share with you about some pretty amazing students in my life, I have asked their permission and I have chosen a word for each of them that describes a trait I see in them. I am so excited to share their lives with you. As I type this I can’t stop thinking about what the picture of brave looks like in my heart and head, if you look up the word brave in the dictionary this is what you’ll find, “adjective, braver, bravest possessing or exhibiting courage of courageous endurance,” (www.dictionary.com). As you can imagine there is bravery all around me, but there is a picture of brave in my life that has been so clear and it comes in the form of a person. 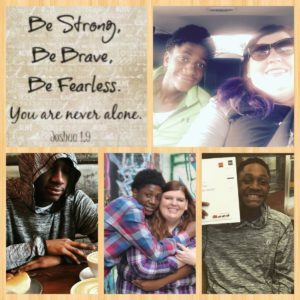 With his permission I want to share with you his story and the beginning of the next chapter of his story, and why I believe he is the picture of brave. In the spring of 2013 a young man who was a part of Kids Club (pre-GEM days) was displaced from his home with his grandmother after an electric fire, they were literally relocated down the street from their current home and across the street from my home. A few weeks after this sweet boy and his grandmother moved in I began to see an older brother who wasn’t really around all that much, when I asked about him I was told that he attended the Seed school in Baltimore and he was only home on the weekends. His name was Antuane. His smile could light up a dark room and his attitude was one in a million and not the good million. He was a kid with a tough exterior, in fact so tough that he didn’t want anything to do with “the white church lady who knew nothing about what his life was like…” to be honest with you I didn’t really blame him, while I grew up in a similar situation being raised by my grandparents and parents who weren’t super involved, I understood that in his eyes there were very few similarities. But for those of you who know me, you know I love a good challenge when it comes to getting to know people and their stories. I was not backing down, even though week after week he would laugh at me and not even as much as say hello. I could feel him mimicking me without using words, I could feel him wish that I would NEVER talk to him again, but honestly those are the very reasons that I fell in love with this kid, because I knew beyond the smile and one in a million terrible attitude there was something to him, there was something more that hadn’t yet come out. Fast forward a few months and due to some unfortunate circumstances Antuane would not be returning to the Seed school, instead he would be moving into his grandmothers house full-time, he would be around all the time. As much as the circumstances killed me, my heart filled with so much joy because this was going to be my chance, my chance to make him like me. It almost felt like I was the outcast and I wanted one of the cool kids to like me and if you know Antuane you know he’s pretty legit when it comes to being cool. I started inviting him to come to Kids Club, I started trying to engage him in conversation, I invited him to family dinners and time after time I would be hit with, “Nah, no thanks, eh…” eventually everything changed and while I wish I could remember the whole scene it doesn’t even matter, what mattered was I had succeeded, and in that moment (as embarrassed as I am to write this) what mattered was I had won, I had won his attention, he agreed to come to Kids Club one night, he agreed to hang out with some of his friends who knew me. I’ve shared with him a few times if I knew then the journey God was going to take us on together I might not have been persistent, I might not have insisted he “like me” I may not have been so hard pressed to break down the walls. But I have also shared with him many many many times and I will continue to share with him is that I love him and that Jesus loves him even more, that God has a plan for him and there is a story in the making of his life. You see little did I know that day that Antuane decided to let me in would be the beginning of a journey, a heart wrenching, scary, educational, hurtful, painful, tearful, prayerful exciting, joyful, and brave journey. As I shared with him this past weekend we have been through hell and back (more than once), I have cried more tears, spent more sleepless nights and prayed more for him than I feel like I ever have, I have been one of his biggest cheerleaders even when he didn’t want me to be and I have loved him in every moment of it, and believed in him even when he didn’t believe in himself. Over the past few years I’ve watched Antuane graduate middle school, become a criminal, stand on the corner (a place I pray I never see my boys standing), sit in a courtroom wondering what the next plan for his life was going to be, I’ve watched him accept Christ, preach a sermon in front of 100’s of people, be baptized, become a leader amongst his friends, invite them to GEM, steal cars, cry over the loss of friends and family members to the streets, I’ve watched him be stuck in the house on “the box”, I’ve watched and listened to him dream about going to college, I’ve watched him have to grow up too quickly. I’ve felt what it’s like for him to “hate me” to push me away to want nothing to do with me because in one of his moments of weakness I knew what was best for him and tried to help him do the right thing, I have watched him run from the police, I have developed a tradition with him that includes Pancake dates when either one of us needs to just talk and be honest with each other we go get pancakes and hash out life together, I’ve fed him and picked him up in times when I knew I shouldn’t, I’ve visited him in a group home when no one else would. We’ve laughed together, cried together, mourned the loss of people we love together, we’ve made memories that will last a lifetime together, he’s become my spy-eyes and body guard, he’s chased off potential bad boyfriends, and there is not one time that I haven’t loved him through all of this or reminded him there is a God who loves him beyond his wildest dreams. I’ve told him numerous times that even in the moments he doesn’t want me there I am going to be there, I am going to be the loudest cheerleader in the room even when he can’t hear me or choses not too, I’m going to love him and take him out for pancakes at two in the morning even when I know that he’s only there because he’s hungry, I’m going to pull out of him what’s bothering him and I’m going to pray with and for him, I am going to continue to invest every ounce of who I am in him and it’s not because I want anything in return it’s because I believe in him, it’s because I know his story isn’t over yet, it’s that I believe that there’s a bigger plan than a street corner and gun charge waiting for him. I’ve drilled into his head that God knows what’s best for us, that God has a plan for us, that we are commanded to be strong and courageous just as Joshua was, that just as God shared with Jeremiah, He knows the plans He has for us for us to be strong and courageous. I’ve reminded him that even at his worst God still loves him and that our God is not a God that choses to love when we’re our best He choses to love us all the time. I’ve reminded him that even when he’s out there doing things he shouldn’t that God is still writing his story. These past few months have been hard and Antuane has been faced with some tough roadblocks, including losing someone in his life that was his heart and joy, including making the decision to be involved in things and places he shouldn’t be and a few short months ago the decision was made that he would be placed as a ward of the state and within a month they would make a decision as to what the next step would be and at the time it was likely that the next step would be a group home. During each of these moments I saw a broken but brave young man standing up to accept the consequences for what he had done. In the middle of all of this a decision was made that Antuane would move out of the city, that guardianship would be granted to a family that would accept and care for Antuane. Another moment of bravery included him making the decision to accept this offer to be removed from the only thing he had even known which was the streets and the city, he accepted and since that day he’s made BOLD steps in his life towards BRAVE change, including signing a behavior contract, attending a new high school where they would most likely realize he wasn’t a kid from the county, making the decision to be committed to graduating high school and going to college, adjusting to a family with a mom and a dad who love him as if he is one of their own. He’s had to make the conscious decision about when it’s wise and unwise for him to come back to the community he loves to visit and when he’s there to make good choices. I have watched this broken but brave young man embrace the story that God is writing for him, I have watched him evolve from a bitter young man who had given up on himself to believing in himself again, I have watched him experience things he’s never done before and embrace every moment of it challenging or not. I’m proud of my brave boy and while I know there’s going to be tough moments ahead in our journey I love the season we are in, I love having my boy back, I love his smile, his laughter and his one in a million (good) attitude. I love watching him embrace each moment and challenge, I love watching him experience life differently in a way that others are influenced. I’ve shared Antuane’s journey with a few people in my life, and the question is almost always why, why do you keep holding on, why haven’t you given up, is it really worth it, it’s obvious he has no desire to be different. Let me tell you how much this hurt because to be honest with you I keep holding on because I have a God who loves me more than my circumstances, and what would it look like if I claimed to love Jesus and love Antuane but when it got hard I walked away? God doesn’t walk away from me when it gets hard and trust me it’s hard quite often in my life, and I refuse to walk away from Antuane or any of my kids when their lives get hard. If there is anything I want you to take away from this it is that bravery comes in many forms, in many places and circumstances and that even in your worst moments there is opportunity to be brave, and that in the middle of all of your circumstances there is a God who loves you beyond you wildest imagination and our God is a God of second chances, and that even when you can’t hear them or chose not too somewhere in your life there’s a cheerleader, cheering for you and wanting only the best for you.